The Chief Prelates of the Malwatu and Asgiri Chapters on Saturday commended Associated Newspapers of Ceylon Ltd (ANCL) Chairman Bandula Padmakumara and the directors for their initiatives to develop the institution which is one of the many over-staffed State institutions in the country. "Often, State institutions which are expected to serve the public break down due to a surplus of employees. This is the result of arbitrary appointments given by politicians. Therefore, de-politicising these institutions is essential to make them viable," they stated, commending the Chairman and the Directors for taking steps to address the issue of excess employees in a manner that benefits both the employer and the employee. The Chief Prelates expressed these views when the ANCL Chairman paid them a visit to seek their blessings for the Voluntary Resignation Scheme (VRS) to be implemented by the ANCL. The Chief Prelates said President Mahinda Rajapaksa has a honest intention to develop State institutions by providing a better public oriented service from such institutions. The moves taken by the ANCL Chairman for the betterment of the institution will be a success. On certain occasions, various unnecessary crisis situations are created within the institution due to some moves taken by the trade unions to gain their narrow political objectives. The Chief Prelate of Malwathu Chapter Most Ven.Thibbotuwawe Sri Siddhartha Sumangala Thera said the employee surplus of the CEB, CPC and CTB had directly led to the collapse of such institutions. However ,Transport Minister Dullas Allhapperuma is acting with a lot of dedication to rebuild the CTB.
" It is not a fact to be astonished about the collapse of any institution if the monthly income of that particular institution is insufficient to pay the salaries of its employees. The moves taken by the ANCL to pay compensation to the employees under its VRS without putting them under pressure to resign is something that is praiseworthy." The Chief Prelate of Asgiri Chapter Most Ven.Udugama Sri Buddharakkitha Thera extended his blessings to the ANCL Chairman to develop Lake House as an example to other institutions. It is a normal fact that certain elements are angry when initiatives are taken to develop the institution. The Chief Prelate also said "it is a great pleasure to have a veteran journalist like Bandula Padmakumara as the Chairman of the Lake House." Most Ven.Buddharakkitha Mahanayaka Thera said we can't approve certain actions taken by some trade unions without engaging in paper marking of students to gain their trade union rights. The longstanding teacher-student relationship is declining due to these unruly acts of some trade unions. As a result, we hear about teacher-student conflicts taking place in various schools. Teachers have a great reputation within society. At present the reputation of teachers has been undermined due to acts of some trade unions. The Thera asked what is the trade union right that a teacher can win by putting students into difficult situations. It is very important that the teachers act in a way that sets examples to the students. ANCL Chairman Bandula Padmakumara told the Chief Prelates there is a severe employee surplus at Lake House. In order to continue the institution as a profit making one, the present total number of 3,200 employees should be reduced to 1,700 employees. After discussions with the President, Prime Minister and the Media Minister, a VRS was introduced to ANCL employees. "Under this scheme, nearly 1,000 employees should be voluntary retired. Nearly 600 employees have at present applied for the VRS. We will not remove any employee by force. According to the VRS compensation will be paid to each employee who retires under this scheme. Under this scheme, an employee who has served Lake House for two years will receive a minimum of Rs.800,000 as compensation. There are some employees who will get Rs.3 million compensation based on their service period. " A sum of Rs.600 million has to be spent to pay to compensate the employees. If 1,000 employees retire under this scheme, Lake House will able to save Rs.500 million annually. In addition to the monthly salary, several facilities have been given to Lake House employees including the Cost of Living allowance, bonuses and insurance coverage. Out of the total income earned by the Lake House, 70 per cent is given to its employees. Padmakumara said Lake House enders a yeoman service towards the uplift of the country's religious and cultural sectors. Lake House also publishes the Budusarana newspaper and Dinamina Vesak magazine. Lake House also prints 50,000 newspapers free of charge to mark the "Dalada Waruna" of the Sri Dalada Maligawa and will publish two magazines in Sinhala and English in connection with the Kandy Esala Perahera with effect from next year. 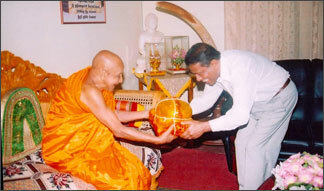 The ANCL Chairman also visited the Sri Dalada Maligawa.